A customer recently had a problem with Windows 2012 DirectAccess connected clients performing desktop sharing, audio and video conversations with internal clients. DirectAccess is a Windows service that is part of the Remote Access role that allows domain joined clients to access internal resources over the internet as if they were on the LAN. DirectAccess does this by providing seamless VPN connectivity without any user input. Lync can work over DirectAccess (and Lync 2013 works a lot better as it supports IPv6) but because the traffic is encrypted and is real time communication, it is recommended to use the Lync Edge server for connectivity rather than sending the traffic over the DirectAccess VPN. 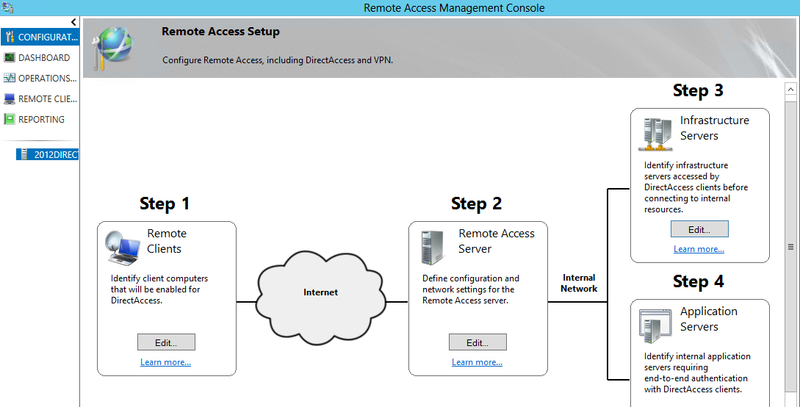 For more information see this NextHop article Enabling Lync Media to Bypass a VPN Tunnel. The primary issue the client was facing was that when users were out of the office using DirectAccess, application sharing / remote desktop failed with an error ‘Sharing failed to connect due to network issues. Try again later’. This meant that internal support staff could not provide assistance for remote users without third party tools. Audio and video would not work either when using DirectAccess. Not having used DirectAccess before, I had a quick scan over the DirectAccess config and went into some testing. I saw that even with DirectAccess disconnected (forcefully disconnect as it starts up automatically) the client could not share programs from Lync and audio/video would fail. So I ignored DirectAccess and started concentrating on the Lync Edge. TMG was being used as the firewall with a DMZ leg that contained the Lync Edge server. I validated all required ports were open as per Reference Architecture 1: Port Summary for Single Consolidated Edge which they were but I still saw a lot of denied traffic on TMG from the Lync Edge internal interface to the internal client IP address. It says it cannot find the host, but DNS resolution is working so it should be able to find the host. This was something I hadn’t seen before and pointed at configuration specific to the remote DirectAccess client I was testing with. I added the AV Edge name and IP into the hosts file – desktop sharing and audio/video worked straight away. This led me to an old OCS and DirectAccess configuration guide Split-Brain DNS: Configuring DirectAccess for Office Communications Server (OCS) which matched the client’s split DNS configuration. The article above talks about the DNS Name Resolution Policy Table (NRPT). Running ‘netsh namespace show policy’ showed that entries existed for sip.domain.com, sipinternal.domain.com, _sipinternaltls._tcp.domain.com etc. as mentioned in that OCS article. However the Web Conferencing Edge and AV Edge names were not on the list. We added webconf.domain.com and avconf.domain.com to the DNS Server Addresses list with a blank DNS server entry similar to the screenshot below. This forces the client to use the DNS of its primary connection, not internal DNS for these specific entries. After that the client can resolve the IP for avconf.domain.com and application sharing as well as audio and video worked while using DirectAccess. The problem was that the client had the same namespace internally and externally and the default DirectAccess configuration forces all .domain.com resolution to the internal DNS servers. Even when DirectAccess is not connected the NRPT configuration remains active. This is why even though it could resolve the address using the public DNS of the mobile hotspot, when it came to actually using the DNS entry for Lync, ping or telnet the DirectAccess NRPT configuration overrides it. A simple solution, but not obvious when troubleshooting with DirectAccess turned off. The takeaway from this is that all Lync external namespaces should be added to the DirectAccess NRPT bypass list. That means all of the Lync Edge interfaces as well as the Reverse Proxy entries for external web services, meet, dialin, lyncdiscover (for the Windows Store Lync clients) and Office Web Apps Server.